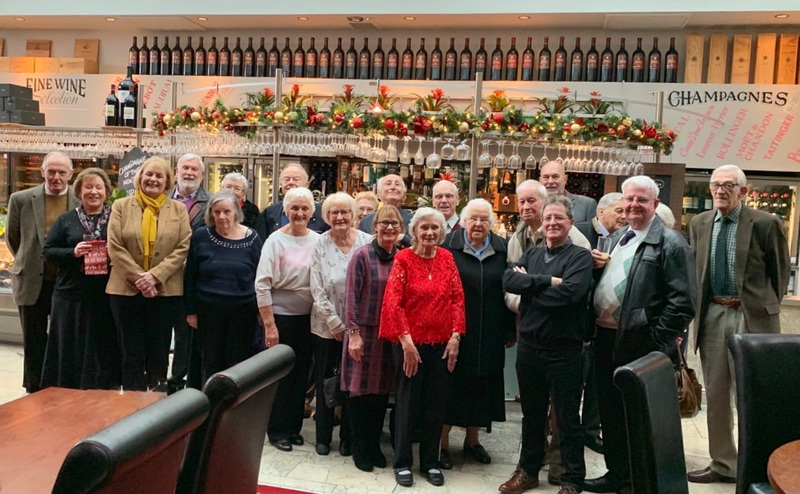 Well we were back at the Custom House for our Christmas lunch and what a good turn out there was despite the awful weather.After assembling in the bar as per standing orders it was down the hall to our room after the group photo. Service as usual was excellent and the time flew by as everybody seemed be enjoying themselves judging by the noise ! Our traditional quiz courtesy of Heather was more difficult than usual or was that because I did not know the answers ? Len’s team won with cry’s of fix from a few of us. ​It was soon time to go after some four hours, everybody seemed reluctant to leave. ​thank you letter can viewed here. Happy Christmas and a Great New Year to all our Members and readers. Watch out for next years events on the programme page. At the beginning of our Summer events, Ray May suggested a late summer lunch. It seemed like ages away, but we agreed it would be a good idea and would be another opportunity for us to get together before the days get shorter and darker. As Ray’s local is El Puerto’s, and he could just wander along to make the booking, pay the deposit and sort out the menu it was decided he was the ‘man for the job!’So, on this occasion we have to say thank you to Ray for organising a very successful ‘Late Summer Lunch’ on Wednesday 12th September. Unfortunately, we had a few cancelations, but we also had a few extra that were anxious to join us and 24 was the final number. El Puerto’s, situated in The Old Custom House, Penarth Dock, now known as Penarth Marina is a lovely location with views over the barrage, Cardiff Dock in the distance and the Bristol Channel. 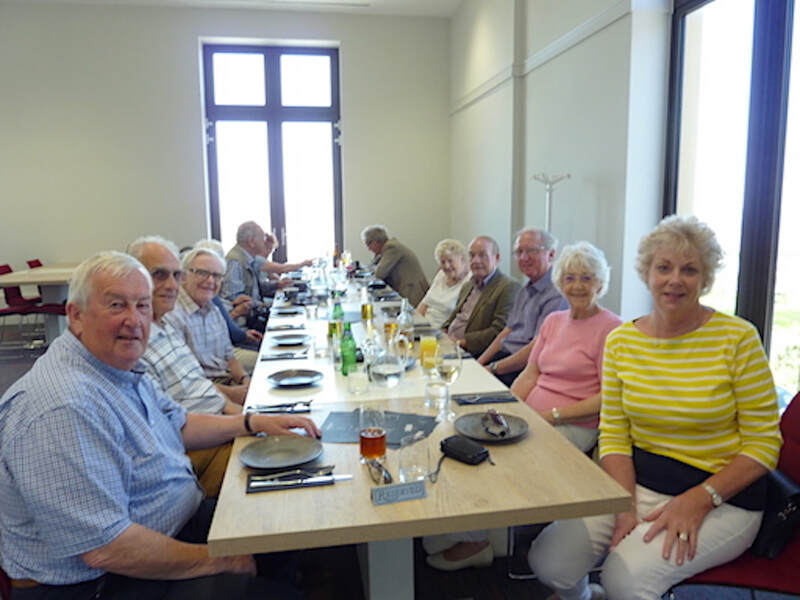 It was busy, with lunch diners, but the service was excellent with our welcome drinks brought to the table and the food being served soon after. I am sure everybody enjoyed their two-course lunch and an opportunity to chat to their friends in such ambient surroundings. It was good to see a few people who had not been able to join us on our other summer events. 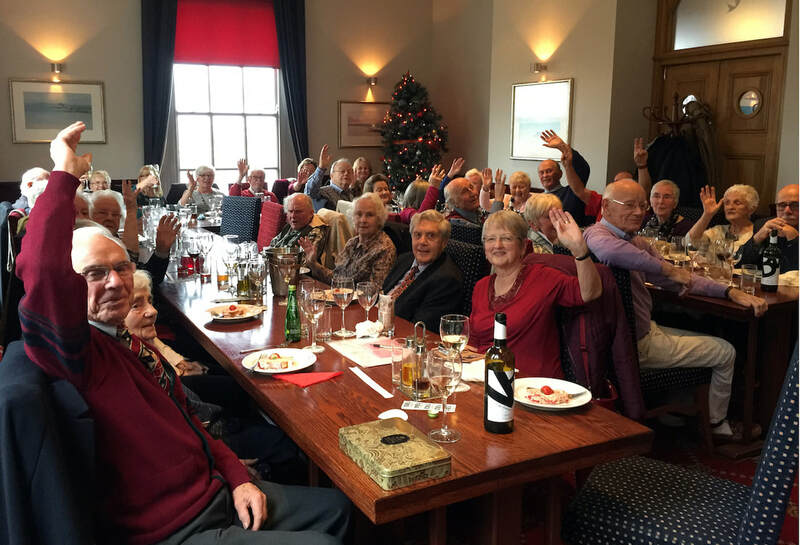 As we all enjoyed this lunch and for those who attended Christmas 2017 lunch at the same venue, it was decided to use this restaurant for Christmas 2018 celebration. Lunch has been booked for Wednesday 5th December 12.30. If you would like to attend, please let Jan know. See the contacts page here. The weather God's were good to us again it being pleasantly warm as we assembled and made our way to the entrance. Fonmon Castle dates back to to the 13th century build by the St John family which is where our lady guide started and together with the family portraits on almost every wall she painted a very interesting and fascinating story. All done with some humour and the promise of a written test at the end of the tour. Wether it helped the names and dates to stick is very debatable in my case. We then made our way upstairs and into the large dining room for tea which was laid out on two very nicely presented tables but alas there was no sign of the promised test, I was so disappointed, I don’t think. The tea was excellent some of us ate to much (me) as there were plenty of sandwiches and lovely lovely cakes and scones and cream and jam, well you get to picture. This we followed with a stroll around the grounds and gardens, all in all a very enjoyable afternoon. Thank you Jan and Hillary for organising the event. Tuesday 24th July and most of us woke up to a grey sky and drizzle…after all the lovely weather we have been having. Thankfully by mid-day when 20 of us met at The Old Post Public House and Restaurant, Bonvilston, Vale of Glamorgan the sun was breaking through the cloud. As all our food choices had been pre-ordered, by the time we had found our seats and purchased a drink we didn’t have to wait too long for our food. Judging by the level of chatter, everybody was pleased to meet up with their friends and catch up with the latest news. Just after 2.00 p.m. we headed just 3½ miles down the road to Dyffryn House and Gardens. Once at Dyffryn, everybody was left to do as little or as much as they wanted to. Dyffryn House is a fairly new acquisition by the National Trust and the house and grounds are very much ‘work in progress’. 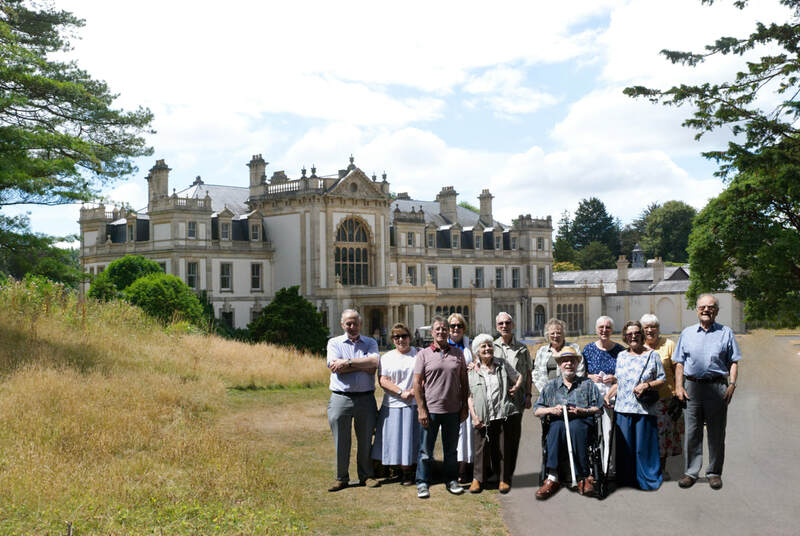 Sadly, over the years, Dyffryn House has had so many uses that it is quite ‘sad’ in places but the story in the house of the original owner – The Cory Family is very interesting. The gardens including the walled kitchen garden, despite the heat and continuing dry spell were looking good. Did anybody venture into the large greenhouse to see the amazing cacti collection, you never know, it may have been cooler in there! Hopefully everybody enjoyed their lunch and their visit to Dyffryn House and gardens. Our next event is Wednesday 15th August to Fonmon Castle, Near Rhoose for a guided tour and afternoon tea. If you haven’t this, but are interested, please contact Jan. The Annual General Meeting took place 17th April 2018 at Bethany Baptist Chapel, Rhiwbina. We were welcomed with a hot beverage and the all-important welsh cake. Prior to the meeting we were lucky enough to have another visit from Mr Richard Wood, who did a power point presentation and talk on the ‘Tonypandy Riots’. 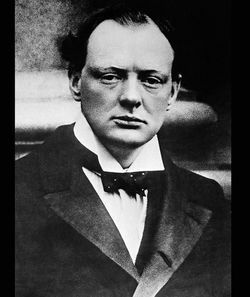 This was extremely interesting, as he outlined some of the myths that surround this historic event and explained how Churchill became involved. Our thanks to Mr Richard Wood for attending. We then had the AGM which was efficiently ‘Chaired’ by Heather with Len and Robert ‘chipping in’ as and when necessary. The usual items were discussed, including apologies, minutes of the last AGM, Chairman’s and Treasurers reports. We also discussed potential places to visit this year and the sort of amount we think is a reasonable budget to adhere to. ​Our thanks to Len and Robert who provided us with a list of ideas for events. If you have any ideas, don’t be shy, let one of the committee members know. Of course, the most important part of the day is lunch! After the meeting most of us adjourned to the Ffynnon Wen and as usual Len and Robert had been busy pre-ordering our food and drink and giving us a note of what we had ordered……..in case we had forgotten. The food and service were good, but as always, things went downhill when we came to pay not helped by the pubs ‘Buy One get One Free Menu’. Robert was given the job of sorting out the final bill and rumour has it that he is still there now! We look forward to seeing as many of you as possible at events during 2018. 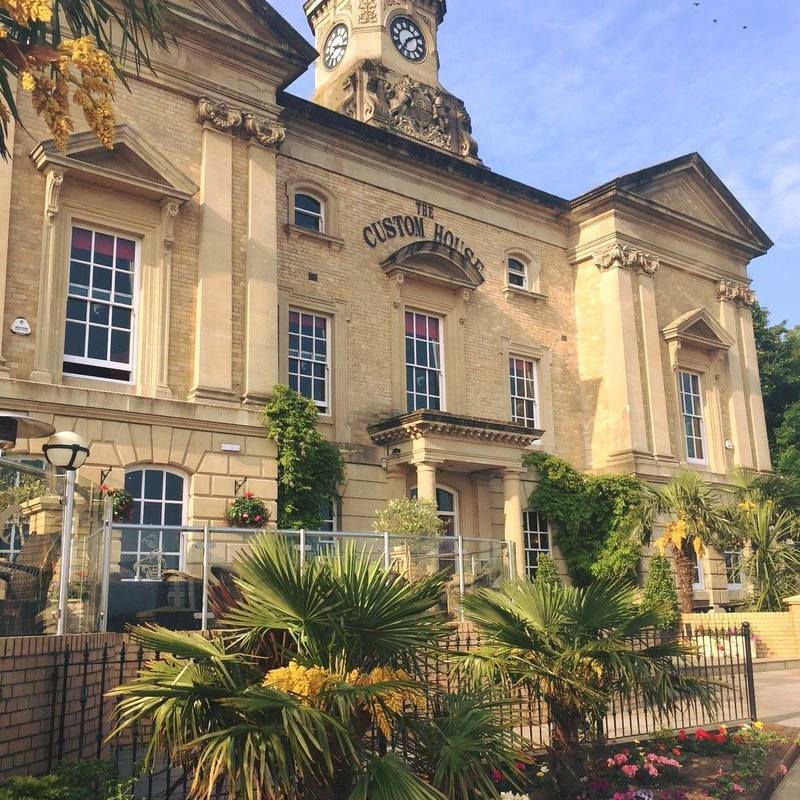 A change of venue this year to the Custom House in Penarth which proved to be a very good choice. A good numbers of members attended and were treated to a great meal meal and good service and of course the excellent company. We are now looking for events next year so any suggestions can be made here on the contact page. 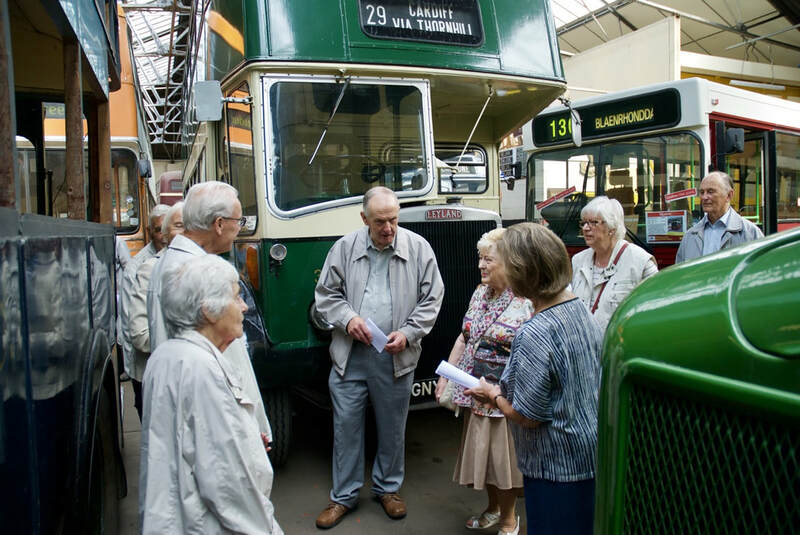 The visit to Barry Bus Museum on Thursday 10th August 2017 attracted a goodly group. We assembled at the entrance for a fascinating tour of the vast bus station which houses vehicles from all over South Wales - Newport, Merthyr Tydfil, Aberdare, Caerphilly and Pontypridd to name but a few. Even a bus from Hong Kong was hiding in a corner ! In 1958 the depot employed 110 drivers, 106 conductors, 24 maintenance staff and 23 office/supervisory staff. Sixty four buses/coaches were allocated to the Depot which could be found operating on routes in Barry, Penarth and Llantwit Major. 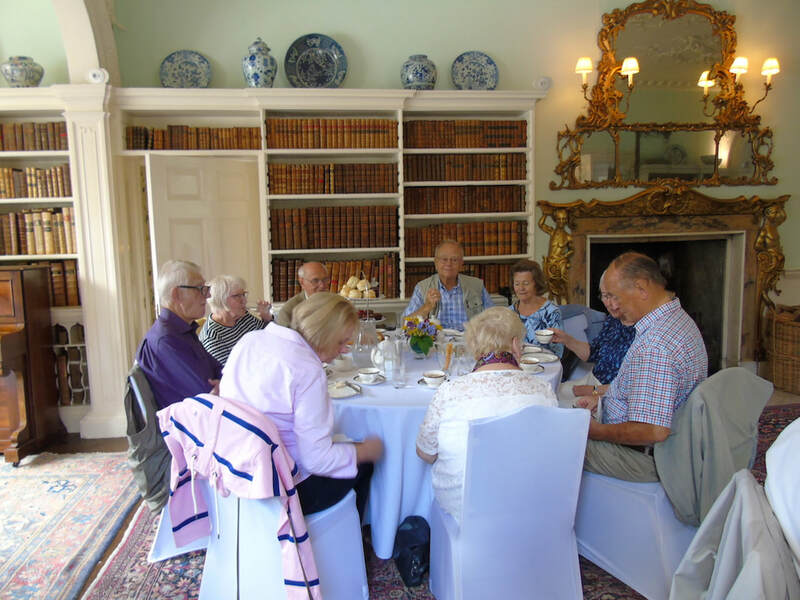 Following a conducted tour of the huge collection, we enjoyed scones, bara brith and and lemon slices and plentiful cups of tea in the tearoom. Many thanks to Jan and Peter for arranging a most enjoyable and informative afternoon, which was much appreciated by all in attendance. Five star accommodation, incredible practical workshop areas, phenomenal study areas with all the latest technology. Would you believe this to be the New state of the art Swansea University. Not to mention the cordon blue restaurant. And all this next to a super sandy beach. I would hate to be a student! A good mix of Swansea and Cardiff members received a conducted tour of the campus which we were able to enjoy to the maximum in glorious sunshine beside the seaside. Also received a tasty and most enjoyable lunch in the fabulous restaurant. It so happened that Eunice Williams granddaughter was on campus, her final year in electrical engineering, we met her and wished her good luck and it must have worked as she obtained a 1st. The event was arranged by Keith, yet another of his successes. The weather gods smiled and we had a nice warm day at this splendid castle. After a short talk by one of the staff on the history of the castle we were left to wander at will and view the various rooms and exhibits including a short video in one room in the gate house. The towers were all climbable but they seemed to get taller as the day wore on... There were a group of school children in the main hall being dressed in period costume and taught about life in the castle. We all stopped and listened at some point as they were there for some time. 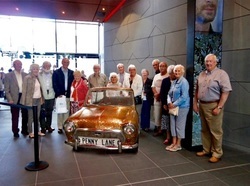 ​In all a very relaxed and enjoyable visit and thanks to Betty Williams for organising this one. We had our customary excellant lunch at the Pendragon which was just over the mountain to round off our day. ​Pictures here and no its not me holding the leaning tower up. Thanks to Roger and Robert for these. Next its the Barry Bus Depot (not to be missed) details to follow shortly. We have had some not so good events, some good and some fantastic and today's visit, arranged by Robert, was in the fantastic. Who would have thought that Paul Kirners Music Palace at Ynyshir ( Where? In the Rhondda Valley ) would have had such treasure. So many wonderful organs in a converted chapel setting, displayed with much thought and artistry. Paul Kirner and Ben Snowdon have spent many hours not to mention a great deal of money converting and stocking this once magnificent chapel that had been allowed to deteriorate. Fellowship members, twenty five of us, were entertained by Paul for almost two hours and we wanted more. He played with such skill and feeling a range of organs, tunes from the good old days that had us enthusiastically foot tapping and some were heard singing. He opened the performance by playing the organ whilst rising from below the stage, just like the time when many cinemas had organs played during the interval. His repertoire was endless and mostly without music. We had a most enjoyable time but I cannot help wondering how many left shoes he wears out on the foot pedals! For those unable to come here are some photographs of what you missed. We met at the the Harvester in Llanishen for coffee and Welsh cakes (must get back to this habit. ed.) and then most of us walked the ¼ mile to the sorting office in the ind est next door. Where we were met by the manager or one of them and after a short introduction we entered the main sorting office. Which was very quiet with hardly a soul to be seen! The reason being should have been obvious. All the work for the day had been done and all the postmen were out delivering the mail. 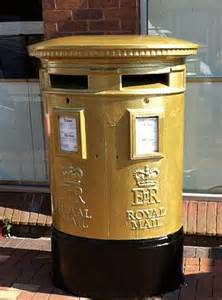 The mail came in from all the mailbox collections in large sacks and were firstly sorted into postcodes and streets and passed onto each postman to sort his or her days deliveries. There were rows and rows of individual workstations with many cubby holes so each person sorted their own route. At the side of each workstation a clipboard which gave the Hazard list for that route i.e. dog/loose/big etc. some area’s having quite a long list, slippery paths was on one I noticed. The manager was very patient and answered all our questions before we split up and wandered around without a guide. It was a bit old fashioned as I think we expected lots of machinery to do all the work of sorting but this was going to happen next year our guide said.This did nothing to detract from the visit because seeing how it has always been done was still very interesting. A gentle stroll back to the Harvester and a very pleasant lunch and chat followed to round off our day. Many thanks to Jean and John for organising the visit. No pictures allowed I’m afraid but here are some taken from the net to give a flavour of our visit - here. Over 30 of our members attended a conducted tour of part of the Royal Mint at Llantrisant which, in total, covers an area of 35 acres. Despite being shown on the "Mint" website for some time, the Visitor Experience was not opened until May. The fellowship was one of the first, if not the first, to arrange a group visit. Following an initial telephone enquiry in February when things seemed to be in their infancy, there followed an exchange of "e" mails with marketing manager Claire Evans one of which was from Berlin, where she was working at a trade show, group reservations manager Rebecca Harris. Both of these ladies were very approachable and helpful. (Len if not already done a letter of thanks would be appropriate). In the event, we were treated to an interesting and informative tour conducted by knowledgeable and enthusiastic guides. 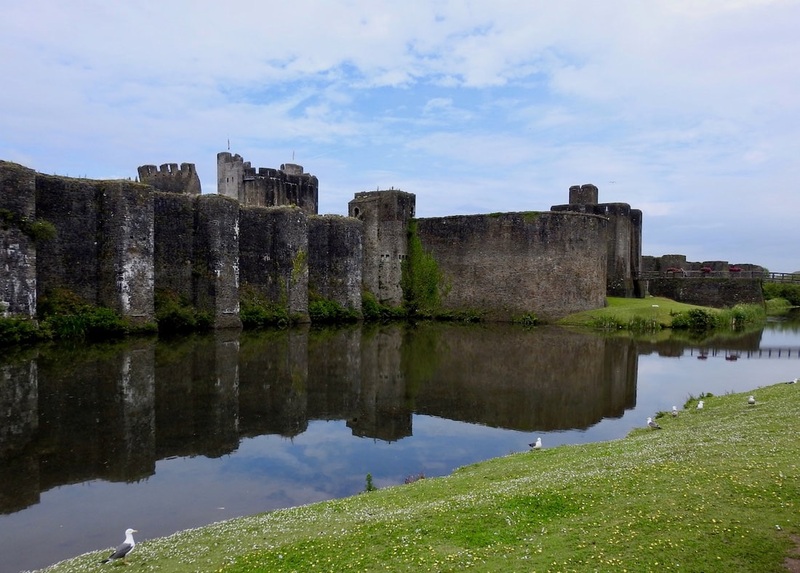 We were advised on the history of the Mint at its various locations and the processes undertaken at Llantrisant, in the production of currencies and commemorative medals for many countries and organisations. As the £1 coin is shortly to be minted in a new design we were fortunate to have the opportunity to strike one of the final issue. You will not find many "2016" in your change, and certainly not in "Mint" condition. Thanks to Len for taking over the nitty gritty confirming numbers and dealing with the administration and payment. The only downside to the day was that, due to a road accident and a fire in Port Talbot, it took the Swansea contingent 2 hours to travel the 30 miles back to The Towers where a good time was had by all. 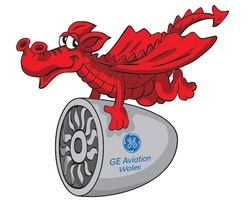 ​GE Engine Overhaul Depot at Nantgarw and obtained our passes and car park sign from the guard and went into the main office to sign in. Then to the boardroom and a presentation by three 2nd year apprentices and Alex a trainee development officer who took turns in explaining the history (founded in 1940 at this site) and what we were going to see. After splitting into three groups it was down to the factory floor and a short walk to the disassembly area where the engine is stripped down into some 5000 parts which are then cleaned, checked for defects and repaired, refurbished or renewed. We saw each process in detail as we followed the blue path around, through and along the factory having each aspect explained in detail by our apprentice in my case Tom. It soon became very evident as to how complicated the engine was and how very meticulous they were on keeping check on each part. The parts when ready were put into order and passed to the assemble area, smaller parts making bigger parts and sub assemblies and finally all coming together at final assembly before going the test rig to be run at full power for some 6 hours or so. There was also a secure area for customs so that nothing is held up for items going to other countries. The whole process taking 20 days or so with penalties for late delivery of an engine. What else? There were no hard hats (some workers had hard caps for under engine work) no high visibility jackets and little sign of H&S, which was quite a surprise although there must been. ​Some areas were very specialised i.e. crack testing dept. Of only specialists 20 in the country this place had 12 of them ! The feel factory had a very relaxed feel and this was confirmed by the Tom who loved working there. All the apprentices have to do some voluntary work and give talks and take group around as part of their training something I never did when I was an apprentice. It seemed to be over all too quickly as we went back to main reception and the obligatory photograph which this time includes the apprentices and a very nice group they were. Many thanks to Ray May for organising this visit which was throughly enjoyed by all. As no photographs were allowed inside here are some extracted from the internet to give an idea of what we saw. Wednesday 11 May dawned dull and drizzly. A small group of Cardiff Aviva pensioners met at the entrance to Cathays Cemetary on Fairoak Road. Our tour guide suggested we commenced our walk around the cemetery before the weather deteriorated. The cemetery was opened in 1859 and Cardiff citizens of all backgrounds have been interred there over the years. Near the cemetery entrance were imposing memorials to well known Cardiff shipping families such as Reardon Smith, Morel and Cory. Also nearby was the memorial to Captain Ernest Willows - a pioneer of airship flight,being the first to cross the English Channel in 1910. There are also a number of war graves. This tour was followed by coffee and biscuits served in the Chapel and a short history given by the guide. Only six of us went to the Pendragon Hotel for lunch. Our thanks go to Len and Robert for their efforts in arranging a most interesting visit and more photographs here. Wednesday April 13th at 10.30am Cardiff Aviva Fellowship held the AGM at Bethany Baptist Church. It was well attended and we were welcomed with tea or coffee and home made welsh cakes which were very enjoyable. ​We then had an informative talk with slides on "A Walk Down Westgate Street" showing the changes over the last sixty years. We all found it very interesting especially the members that had lived in Cardiff all their lives. The AGM followed and the committee were re-elected. We thanked them for the work they had done last year and also for the plans that had been made for future meetings during this year. We all enjoy the meetings and it was good to see everyone after the winter break many old friends and new faces. Lunch was held at The Pendragon in Thornhill where we enjoyed a good meal with excellent service. Thanks to everyone for coming and making it such a good day. 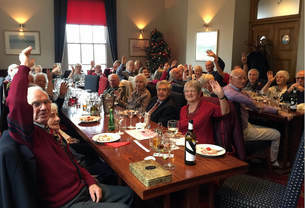 A very familiar question I suppose but here we all were at another Christmas Lunch and very pleasant it was with good company and good food served by a very friendly and efficient staff at the Pendragon Cardiff. ​Although the numbers are getting smaller we had 30 for this lunch with many old friends and some welcome new faces. Sadly there was no sign of Len’s musical quiz (shame I hear you all say) but there was the general knowledge one from Heather and a picture one from Robert. It all went much to quickly and very soon we were saying our goodbyes and looking forward I hope to more outings next year so it would very nice to have suggestions from our members so we can get things moving. Wishing you all a Very Merry Christmas and a Great New Year to all members and friends from the committee. When accepting the invitation to attend the Rhymney Brewery Blaenavon and Cheese tasting we were not sure what to expect but at least the weather was fine and it was a pleasant drive through some beautiful countryside. After the welcome Sue Woodhouse the co owner of Blaenavon Cheddar Co Ltd gave a talk on her family run business which produces award winning attractively named variations of cheese using local Welsh ingredients. We enjoyed a tasting session which encouraged most of our group to later attend her nearby shop. We were then given a potted history of the present Rhymney Brewery Blaenavon which was formed following the takeover of the original Rhymney Brewery by Whitbread in 1978. That Company had existed over 140 years originating in the days of heavy industry with hot blast furnaces causing terrible thirsts. Also in those days it was safer to drink beer than water. The present family run Company has brought back the old traditional flavours and again we enjoyed a tasting session of their 6 regular beers which resulted in some keen purchases from the Brewery shop. Our outing included lunch at the local Lion Hotel and for £10 for 2 courses we were not expecting too much. However having made our choices previously everyone was delighted with the quality of the main courses and the deserts were just as well received. Overall it was a very enjoyable day out with a very friendly group and many thanks to Jean & John for taking the trouble to organise it. Stuck for somewhere to go? This website is independent of Aviva plc. Its content is provided by and for South Wales Aviva members, and must not be taken to have the approval or agreement of Aviva plc. All photographs (c) South Wales Aviva Fellowship.